this weekend we had a plethora of cookouts so I had to dig out my trusty recipe binder full of cut out recipes and ones printed after watching cooking shows. I needed to make a side for a cookout and this was the ingredient I had on hand – potatoes – yep that’s it, a big ol’ bag of potatoes, make it work Tara! I was getting tired of my old potato salad recipe (sorry mom) even though I had made some great variations to it by adding bacon and dill and all sorts of other random things to spice it up. I have tried my go to cooks versions on foodnetwork.com, Ina, Alton… but nothing has knocked my socks off. Then BAM! I remembered I had printed an Emeril recipe for Smashed Potato Salad when we were stationed in Sicily and I had not made it in several years. So I said what the heck, I’ll give it a try. I did not really smash up the potatoes as it said to do, but you can modify the texture to how you like it. It looked a lot like my current recipe with the standard ingredients of potatoes and mayo and hardboiled eggs, but it had a few key differences that really made it mmm mmm good! One was the yellow onion, usually I use purple, and it gave it a nice bite. Second was dijon instead of yellow mustard, and that added a nice sweetness. 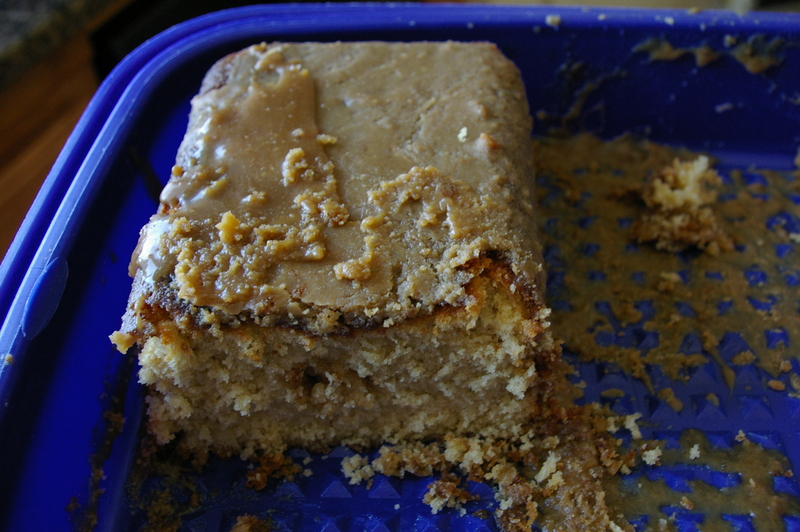 Third was brown sugar instead of white, just a spoonful, but the brown really added a nice maple flavor. There was also no vinegar as there usually is, replaced by worcestershire sauce, and this really makes the dressing part of the recipe taste superb. Plus the addition of garlic added some more depth and flavor to the salad. I modified the recipe as I usually do, opting to leave out the hot sauce and lemon. I actually think the hot sauce would be ok but I didn’t feel like it that day. As far as the lemon, that’s a personal preference thing, and I love lemon, but something about lemon and potatoes just doesn’t jive in my mind or tummy. So if you are looking for a fresh take on potato salad try this recipe out, it has small modifications that make a big difference. My guests licked their plates so I guess it worked! For me, food is love. I love to cook for the people I care about and make them and their tummy’s happy. It is my best way of showing how much I care for someone, by putting together ingredients that harmonize and turn into a fiesta for your senses. Even if I am making something very simple, such as a sandwich, I put every bit of love into it. Most guys love meat and potatoes and my hubby is no exception. So I am always trying new recipes to knock his socks off. I got tired of the same old meatloaf recipe so I went in search of a new one on Foodnetwork.com. There were so many to choose from and some I have tried, like the cheeseburger meatloaf from Paula, (which you know has like 10 sticks of butter in it) which turned out ok. Or the cornbread meatloaf recipe from Guy that I printed but have yet to make (I will blog on that if I try it, I promise). I had to print this one because my hubby loves cornbread and he loves meatloaf so how can you go wrong? The most successful meatloaf I have tried was Ina Garten’s mini individual meatloaf recipe, which is very easy and impresses your guests. I made it when my folks were here as my dad loves meatloaf too. It makes 6 mini meatloaves so each of your guests feel like they got their own little meaty present. It is ridiculously moist and very flavorful, due to the fresh thyme. I had never used fresh thyme before and now if I find a recipe that calls for it, I will use it because the taste was phenomenal! I actually have a great recipe for grilled potatoes that calls for thyme and the recipe is only amplified by the fresh thyme I now use. So if you have someone in your life that loves meatloaf, or you love it, you have to try this recipe! 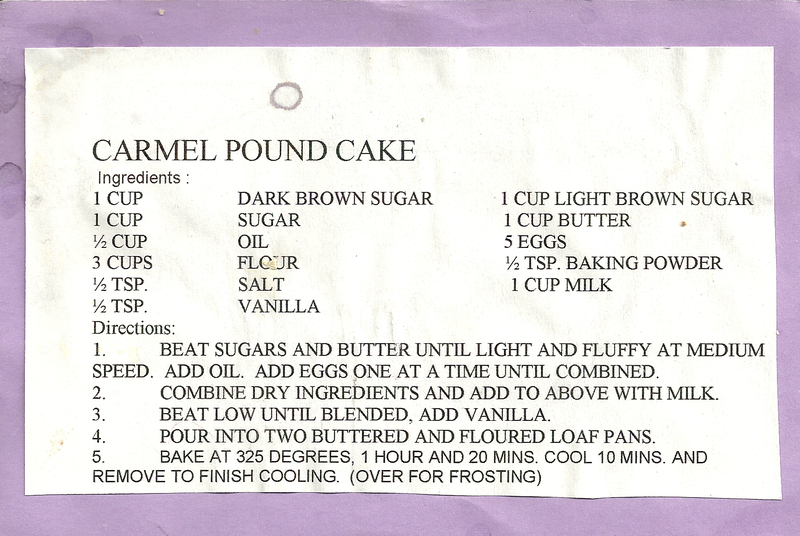 Got me like Oh My God, I’ve got so many ways to love … carmel pound cake! excuse the snacks on the recipe, well I guess that means it is a good one right? enjoy! If you have come by my house recently you might be shocked if you see my fridge. Those who know me well know I love to cook and cooking is my passion and a way I relieve stress. But lately I have not been grocery shopping in forever, other than for staples, so our fridge and pantry look pretty sad. Really, even Old Mother Hubbard would think my pantry was pretty paltry. The other night I had to come up with a side to go with my grilled chicken for dinner. I did not have really anything to choose from, no brown rice (see previous post) and I am so over G’s cheesy noodles. So I found half a box of Barilla Orzo in my pantry and my hamster wheel started turning! If you have never had orzo before it is sort of like teeny tiny pasta that is shaped like rice. It is oh so yummy in sauces and soups and I decided to throw together a pasta salad. I boiled up the orzo and searched my fridge for some ingredients. I had some left over antipasto (I will write a great post about this soon, it is a great way to impress at a party, without having to cook) and I decided I could make that work. So I chopped up the small amount left of marinated mushrooms, artichoke hearts, garlic stuffed olives, a few slices of salami – that I chopped very small, mozzarella, and some fresh tomato. I also added some of my mom’s amazing signature “Brown” dressing (she makes the good seasoning dressing with balsamic vinegar) and some fresh basil from my pretty herb garden that Campy planted in our backyard farmers market. Seriously I should charge admission and let people pick their own veggies! 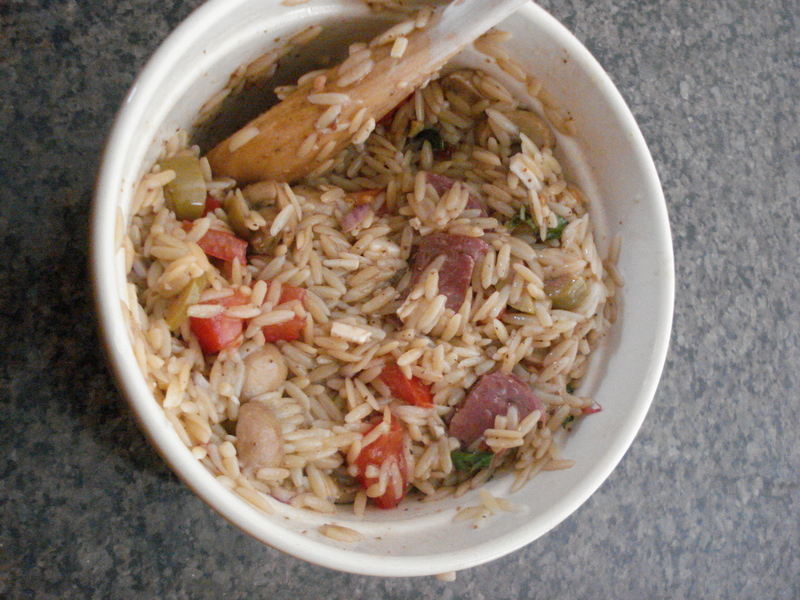 After the orzo cooked I tossed it with this leftover fridge concoction and it turned into gourmet heaven! It looked like I made some fancy deli pasta salad but it literally took me a few minutes and was made entirely from leftovers that would not have been enough on their own to be used for anything else. So sometimes when you are on a budget you have to get creative. Let me tell you, this salad lifted my spirits, as I was in a cheesy noodle funk. I am not sure how anything that orange is appetizing, but hey it is cheap! So next time you are stumped for a side see if you have any leftovers – half a tomato, an avocado, some marinated peppers, lunch meat, some herbs or a dressing, and some small pasta of any kind, and before you know it, you can have a gourmet dinner too! 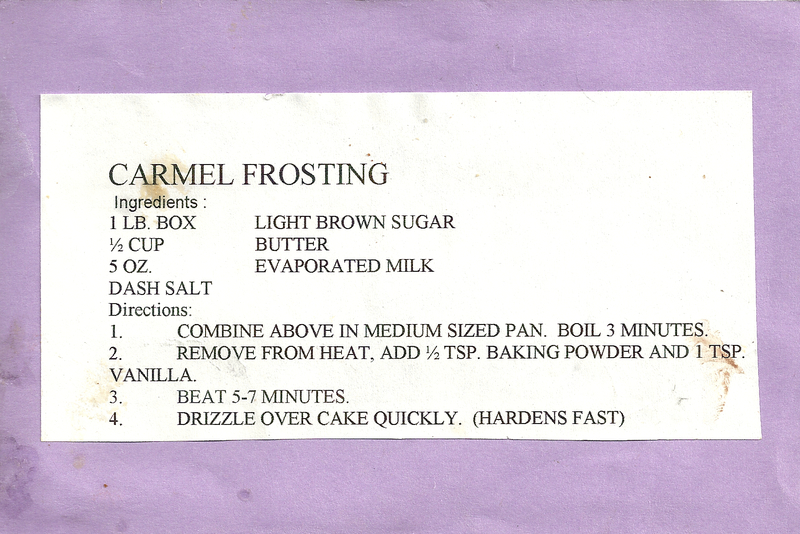 You are currently browsing the What Tara's Cookin' blog archives for June, 2010.